86Duino EduCake (EduCake) is an open-source microcomputer learning platform built on Vortex86EX, a System-On-Chip (SoC) built with 32-bit x86 processor. The EduCake is designed to be electronically compatible to the Arduino platform. In addition, the EduCake includes Arduino emulation software which enables application codes written for Arduino (sketch) to be compiled and run on the EduCake without modification. In a nutshell, the EduCake is hardware and software compatible to the Arduino platform. The EduCake is packaged in a compact, yet functional metallic enclosure with an integrated solderless breadboard that exposes I/O pins compatible to the Arduino, designed to help hobbyist and student experiment different electronic circuitries, to learn microcomputer and embedded system, without the need to solder. In addition to the Arduino compatible I/O pins exposed through the solderless breadboard, the EduCake enclosure provides additional I/O, such as Audio input/output, USB, Ethernet, Serial and SD slot to support SD flash storage card. The 5V power input connector is a Type B micro USB female connector, which is also the interface to the development computer to upload application code (sketch) from the 86Duino Coding IDE. And there is a power ON/OFF switch and a power indicator LED. 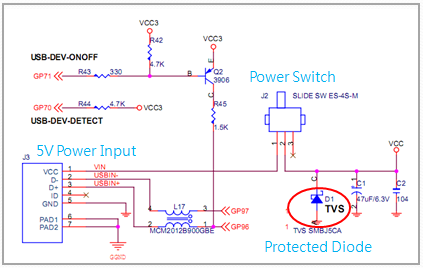 While the EduCake is using a simple power circuitry, from the above schematic, you can see the circuit includes Transient Voltage Suppresser (TVS) diode to protect the internal circuit against power surge during initial power on. Without any external USB device attached (ex. USB keyboard or USB mouse), EduCake requires at least 400mA to operate. An USB 2.0 interface on the PC can provide up to 500 mA. 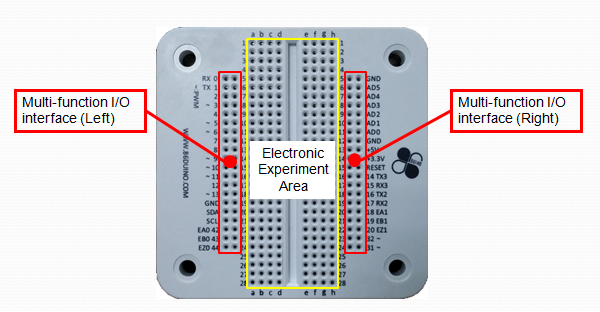 External USB devices or electronic components on solderless breadboard attached to the EduCake will increases the power needed for EduCake to operate properly. In this case, it is not suitable to power EduCake by using USB 2.0 interface on the PC, consider to power EduCake by an USB 3.0 interface that can provide up to 900 mA on the PC. Note: USB interface on some of the older PC is designed to provide less than 500 mA of power and may not be sufficient to support EduCake’s power requirement. 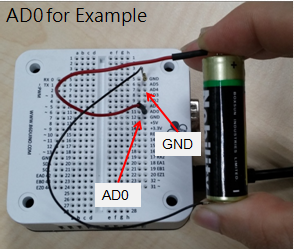 You may not boot or upload sketch via 86Duino IDE to EduCake by using such USB interface. In this case, recommend to retry on another PC. The power indicator LED on the front of the EduCake should turn on to indicate power is flowing through the unit and enables EduCake to function. The EduCake’s integrated breadboard has 5V and 3.3V output that can function as power source for experimental circuit. The 5V output on the breadboard is linked to the 5V power input on the EduCake. The 3.3V output is through an internal regulator and able to supply up to 400mA current. Note: For example, when 5V 1000mA power source is used to power the EduCake, 400mA is needed for EduCake, the remaining 600mA is available to support the 5V output pin on the breadboard (assuming there isn’t other USB device attached to the EduCake). As for the 3.3V output pin, the output current is limited to 400mA, regardless of the high current source available from the external power supply. When working on circuitry that expect to draw higher current, such as to drive a servo or motor, it’s best to incorporate external power source, and make sure the external power source is sharing the same ground as the EduCake. 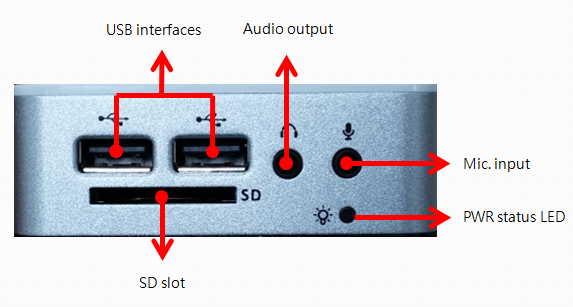 The SD slot on EduCake support SDHC card, up to 32GB. SDXC is not support. Note: When installing Windows, Linux or other OS to boot from the SD storage card, the SD storage card’s read/write speed directly impact system performance and boot up time. It’s recommended to use Class 10 SD card. The SysImage utility is provided to enable you to format and configure SD storage card to boot 86Duino firmware. It has many advantages by booting from SD card on EduCake, see the detail here. During power on, the EduCake’s system BIOS search for bootable file partitions from 3 different sources: SD storage card, USB storage and Internal flash storage. Boot sequence: SD storage card is first, then USB storage and finally is internal flash storage. During power on, when a bootable SD storage card is inserted, the EduCake will boot from the SD storage card. Otherwise, it will search for bootable storage attached to the USB interface. When storage devices are not attached to the SD slot and USB interfaces, EduCake will boot from the internal flash storage. Note: When non-bootable SD or USB storage is attached to the EduCake, it prevent the EduCake from booting from the internal flash storage, causing the system to hang. Simply fix the non-bootable storage and reset power to boot. 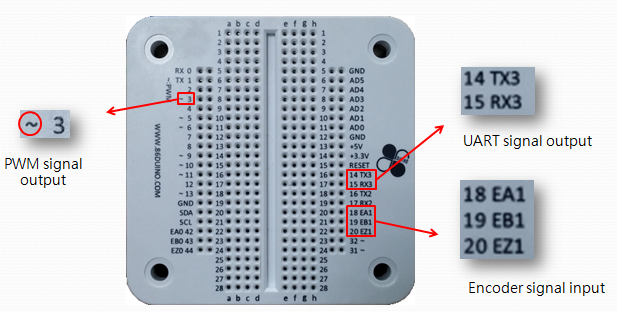 The EduCake’s GPIO pins are positioned on the left-most and right-most column on the breadboard, with marking to identify the pins, 0 ~ 20, 31, 32, 42, 43 and 44, totaling 26 pins, as shown in the figure below, where you can call the digitalWrite() function to set each pin to HIGH or LOW and call the digitalRead() function to read the pin status. Each of the GPIO pin can be configured to function as input or output, by calling the pinMode() function with proper parameter. When a GPIO pin is configure to function as output, the PIN will output 3.3V when set to HIGH and 0V when set to LOW. The maximum current each pin is capable to output is 16mA. When configured as input, each GPIO pin supports 0 ~ 5 voltage range. Note: While there are added circuitries to protect these GPIO pins, its ability to protect is limited. High voltage, high current and short will cause permanent damages. It’s good practice to be careful and implement electronic components and power source within the supported range. For more information about GPIO, refer to Fundamental Hardware Concepts. Each of the 6 A/D input is capable to handle 11-bit resolution analog input. You can call the analogRead() function to read each of these A/D input. To maintain Arduino platform compatibility, the analogRead() function reads 10-bit resolution data from the A/D pins. You can use the analogReadResolution() function to increase the resolution up to 11-bit. Note: The input voltage range for these A/D input is 0V ~ 3.3V. It’s important to keep input voltage to each of these A/D pins within 3.3V. When the input voltage for anyone of these A/D exceed 3.3V, it will create unpredictable result on all A/D pins. In the worst case scenario, it can permanently damage these A/D input. For more information about A/D input, refer to Fundamental Hardware Concepts. EduCake’s I2C interface support standard mode (up to 100Kbps), fast mode (up to 400Kbps) and high-speed mode (upto 3.3Mbps), 3 different modes to communicate with external devices. According the I2C specification, when connect to external device, both SCL and SDA pins should be connected a pull-up resistor (refer to I2C Wiki for more details). Value for the pull-up resistor vary depending on the I2C transmission speed. To support 100Kbps and 400Kbps modes, we recommend that you add a 4.7K Ohm pull-up resistor. To support 3.3Mbps mode, we recommend that you add a 1K Ohm pull-up resistor. There are 9 GPIOs on the EduCake capable to output PWM signals, pin 3, 5, 6, 9, 10, 11, 13, 31 and 32. From the 86Duino Coding IDE, you can call analogWrite() function with proper parameter to control each of these Pins to output PWM signal. EduCake is able to output PWM signal up to 25Mhz or 32-bit resolution. To maintain compatibility to the Arduino platform, EduCake is configured to output 1KHz 8-bit resolution PWM signal. The analogWrite() function is designed to output PWM signal at 1 KHz fixed and cannot be changed. To output PWM signal at resolution, up to 13-bit, you can use the analogWriteResolution() function. To output PWM signal at different frequency, you can use TimerOne library to output PWM signal, up to 1 MHz. For more information about PWM, refer to Fundamental Hardware Concepts. The EduCake has serial interfaces available, TX1(1)/RX1(0), TX2(16)/RX2(17) and TX3(14)/RX3(15), each can support baudrate up to 6Mbps. To communicate with external device via these serial interfaces, you can use the Serial library to transmit and receive data. Note: The 3 TTL UART interfaces on the EduCake is at LVTTL voltage level (0 ~ 3.3V). Do not connect one of these interfaces to an RS-232 port, which is at 12V and will damage the TTL UART interfaces. 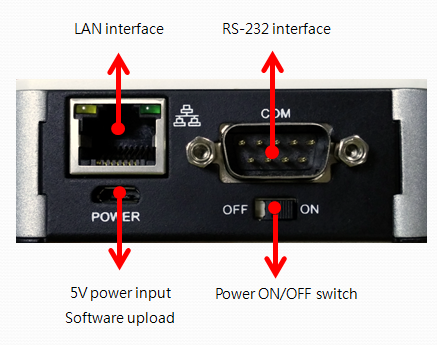 There is one RS-232 interface on the EduCake, through a DB-9 connector on the back of the unit, which can support data transfer rate up to 1.5Mbps. 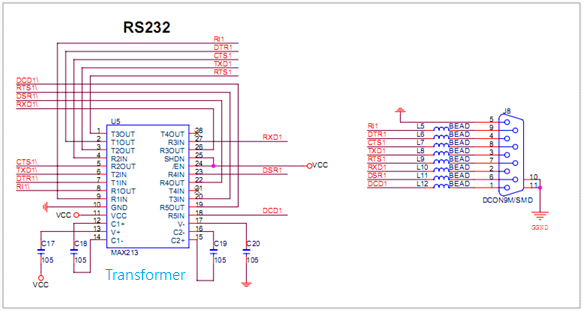 You can use the Serial232 library to transmit and receive data through the RS-232 serial port. Note: Voltage level for the TTL UART interface is between 0 ~ VCC (0 ~ 3.3V or 0 ~ 5V). Whereas, voltage on the RS-232 interface range from -12V to +12V via a voltage transformer like following figure. Connecting a TTL UART interface to RS-232 will cause permanent damage. There is one 10/100 Mbps LAN interface on the EduCake. You can use the Ethernet library to transmit and receive data through the LAN interface. EduCake has integrated audio function using Realtek ALC262 HD audio Codec chip and provides stereo audio output and microphone input interfaces through two 3.5 mm jacks on the front of the unit. You can use function within the Audio library to access the audio function. EduCake is built with two USB 2.0 interfaces on the front side, which can support USB HID (keyboard or mouse), storage and other devices. Under the 86Duino Coding environment, you can use USB Host library to read data from USB keyboard and mouse. When EduCake is running Windows or Linux operating system, the USB 2.0 interfaces can support USB-WiFi, USB-Camera and other USB devices. EduCake is built with encoder interfaces that support incremental and absolute optical encoders. These encoder interfaces can handle up to 25 MHz input frequency. You can use the Encoder library to read data from the attached encoder. 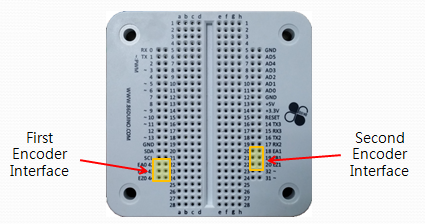 EduCake has two groups of Encoder interfaces accessible on the solderless breadboard, group-1: EA0 (42) / EB0 (43) / EZ0 (44), group-2: EA1 (18) / EB1 (19) / EZ1 (20), as shown in the figure below. The following tables provides information showing the mapping between the GPIO pins on the EduCake and the corresponding GPIO port in the Vortex86EX chip.